BMW Motorrad does know a thing or two about big adventure-touring motorcycles. In fact, the R 1200 GS (now 1250) is world renowned as a continent crusher. And they’ve even taken a stab at the other end of the spectrum with the single-cylinder G 310 GS. But as they say, the middle ground is always the more sensible spot than the extremes, right? In most automobiles, the mid-level variants sell in the highest numbers. In families, the middle child is the most sensible (or so we’re told). And you know the drill… In BMW Motorrad’s ADV lineup, the F 850 GS represents the new middle ground. So does that make it the most sensible amongst BMW’s ADV offerings? And does it do enough to take on our absolute favourite in the middleweight adventure tourer segment - the Triumph Tiger 800 XCx? The whole point of having a mid- or large-capacity adventure tourer is to cover highway miles with ease and in comfort. But on this front, the 850 isn’t too impressive. There are a couple of issues that really stand out. First, the stock windshield is too short and doesn’t feel adequate at highway speeds. To make matters worse, it’s completely unadjustable, and for my seating position, I kept hearing all sorts of whistling in my helmet, thanks to the wind. Then there’s the seat. It’s acceptable for shorter rides, but it does feel a tad too soft. So spending long hours in the saddle isn’t very comfortable. Also, at 860mm of seat height, shorter riders are going to find it tricky to get their feet on the ground. The overall riding position too seems to have been designed with taller riders in mind, with the handlebars feeling like a bit of a stretch when you’re sitting down (at least for my 5’10” height). If you are planning long journeys, then this Pro version that we tested comes with pannier mounts. Unfortunately, like most things BMW, the panniers themselves are optional accessories. The one area where it massively impresses on the highway (and even in the city) is its fuel efficiency, where it even managed to outdo the Triumph Tiger 800 XCx. But while the efficiency is slightly higher, owing to its smaller tank, the 850 has considerably shorter highway legs compared to the Tiger. Does it pack a punch? The F 850 GS is powered by a new 853cc inline-twin engine that gets a 270-degree crank. That makes it fairly punchy in the mid-range, much like a V-twin. Internationally, it makes the same power as the Tiger 800, but in India, BMW Motorrad has seen fit to detune it a little to run on 91 octane fuel. It does make more torque compared to the Tiger though. Thanks to its great mid-range torque, once you get the motor past 5,000rpm, the bike really shoots ahead. In terms of outright acceleration from standstill to 100kmph, it comes out slightly ahead. But this engine has a distinct lack of bottom-end torque. So whether you’re accelerating from slower speeds, or going from zero to 60kmph, it’s not as quick as the Tiger. Tractability suffers a little too, and the 850 lugs a little even when you open the gas at 60kmph in sixth gear. In order to compensate for this lack of bottom-end torque, BMW has made the first, second and third gears shorter, so that the bike will still have the grunt to make its way through the dirt, on slow speed trails. And fourth, fifth and sixth gears have been made taller for more relaxed highway cruising. But that means if you need to overtake quickly at highway speeds, you need to downshift a gear or two. However, the biggest issue that we had with this motor is that it sounds really clattery when you’re cruising - something you don’t really associate with a BMW. Highway junkie or corner carver? Now, there are a couple of aspects of the 850’s handling that we need to address. First, in the city, the bike feels quite manoeuvrable as the steering has great range on either side. Plus the bike is quite narrow, so finding gaps through traffic is fairly easy. But shorter riders might find this a bit cumbersome, thanks to the bike’s tall seat height. Show it some corners though, and things feel entirely different. The wide rake angle means that the front end feels quite vague when steering it into corners. Then, the long trail also makes steering feel quite lazy. Couple that with the fact that you’re sitting quite far away from the front end, and you’ll realise that the 850 isn’t the most fun bike to throw around a winding mountain road. The long wheelbase does give it a fair amount of stability when leaned over though. On the tarmac, the twin 305mm discs at the front and the single 265mm disc at the back do a pretty good job of pulling this 229kg bike to a halt. In fact, in our tests, braking distances were slightly shorter compared to the Tiger 800 XCx, which is actually a lighter motorcycle. But brake feel at the lever is not too great. While the F 850 GS doesn’t impress terribly on tarmac, the one place where it really feels special is when off the road. Now, as we’ve mentioned, this is actually heavier than the Tiger. But when you’re riding in the dirt, it feels far from heavy, and that’s thanks to excellent packaging and mass centralisation. The inline-twin engine itself is quite compact and narrow, and sits rather low in the bike. Then the bike itself is very narrow, which means gripping it with your knees when standing on the pegs is very easy. And the stand-up ergonomics are among the best. 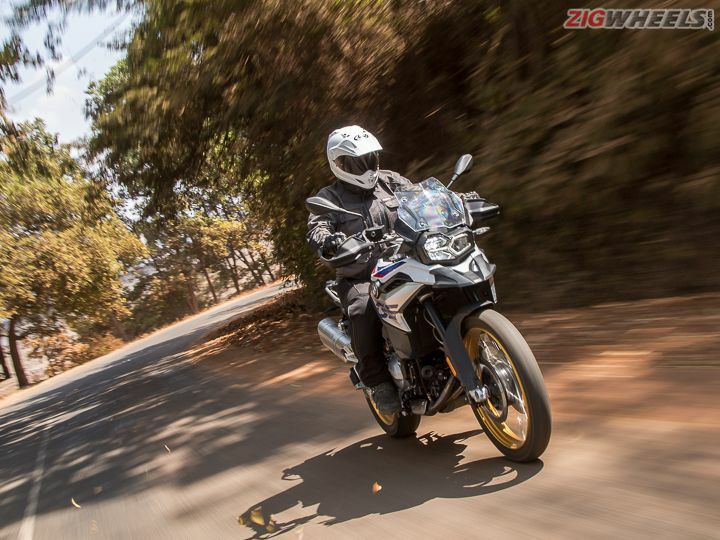 Where the Tiger feels top-heavy when on the pegs, the 850 feels well-balanced and neutral. In the loose stuff, the 21-inch front and 17-inch rear spoke wheel setup really comes into its own as well, and the standard Michelin Anakee tubeless tyres (90/90 R21 front and 150/70 R17 rear) do a pretty decent job in the dirt too. However, if you want to ride off the beaten path more often, we’d recommend more aggressive off-road rubber. To help its case off the road, this Pro version offers electronically adjustable rear suspension as well, which, at the touch of a button lets you adjust damping as well as preload settings. This semi-active rear suspension monitors rear wheel travel, and adjusts damping automatically based on the selected mode and the surface you’re riding on. And this ensures that the rear wheel maintains as much contact with the surface as possible - great for maximising traction in the dirt. That said, the front offers no adjustability, and can feel a bit too soft at times, bottoming out over really sharp bumps. While the F 850 GS doesn’t come with a ridiculous amount of electronic aids, what it does get, works really well and really helps while riding in a variety of conditions. This Pro model that we tested came with Dynamic Traction Control as standard, and the beauty of this traction control system was that it didn’t feel too interfering when pushing the bike hard, no matter on what surface. It cut in gently and kept the bike perfectly under control without letting the rider know that he was being nannied by electronic systems. Then, there are four riding modes as well (Rain, Road, Dynamic and Enduro), which adjust everything from engine response, power delivery to even rear suspension setting based on the selected mode. And our test bike came with an Enduro Pro mode as well (enabled by plugging a special USB key under the seat), which lets you dial back traction control and ABS settings even further, and allows the rider to go even more mental in the dirt. The other thing that’s impressive about this F 850 GS is just how well put-together the motorcycle is. The quality of plastics is top notch, the panel gaps are extremely consistent and everything just feels solid - like a proper BMW should. Then, even the switchgear feels extremely premium, although granted, it’s not the most intuitive to use. You can also get an excellent full colour TFT instrument screen, which has Bluetooth connectivity, music control and even navigation. And it can also act like a hub for helmet headsets - to facilitate communication between the rider and pillion. That said, this screen is a 60,000 rupee extra! While this isn’t a comparison, I’ll have to admit that if I’m going to be riding mostly on the road, with a bit of off-road thrown in, I’d pick the Tiger XCx any day. Its engine refinement and tractability is just phenomenal. Then there’s the price as well. At Rs 14.40 lakh (ex-showroom India) for this Pro model, it is about twenty grand more than the Triumph Tiger 800 XCx. But BMW is getting the F 850 GS to India as a CBU from Thailand, and not a assembling it here like the Triumph Tigers. This means that the 850’s on-road price, at least in Maharashtra shoots up drastically higher compared to the Tiger’s. But, if price isn’t an issue, and you have a thirst for adventure, this F 850 GS is just phenomenal. It’s a shining example of just how well BMW Motorrad understands adventure motorcycles. And sure, it won’t crush continents like the R 1250 GS, but off the road, it is a lot easier to manage. It really drives home the point that the middle child is the most sensible one of the family. Share your experiences with F 850 GS?